This week I did more background research regarding Donna’s career with the “Chin Chin” production. I still haven’t determined dates or venue for their Minneapolis showing (other than late January to early February, 1920). I did, however, find where the production played at the Lyceum Theater in Rochester, NY sometime during the week of March 5th. [i] More about that in a future article. Other than some basic advertising in “The Fort Wayne Journal-Gazette” (Fort Wayne, Indiana), I was unable to find any articles heralding the show. Although it had to be a busy Sunday. They played in Madison, Wisconsin on the 14th, both a matinee and an evening show then made it to Fort Wayne for an show the next evening. It is about 300 miles between Madison and Fort Wayne so it had to have been a late night packing, loading, sleeping on the train, then setting up for the show the next day. 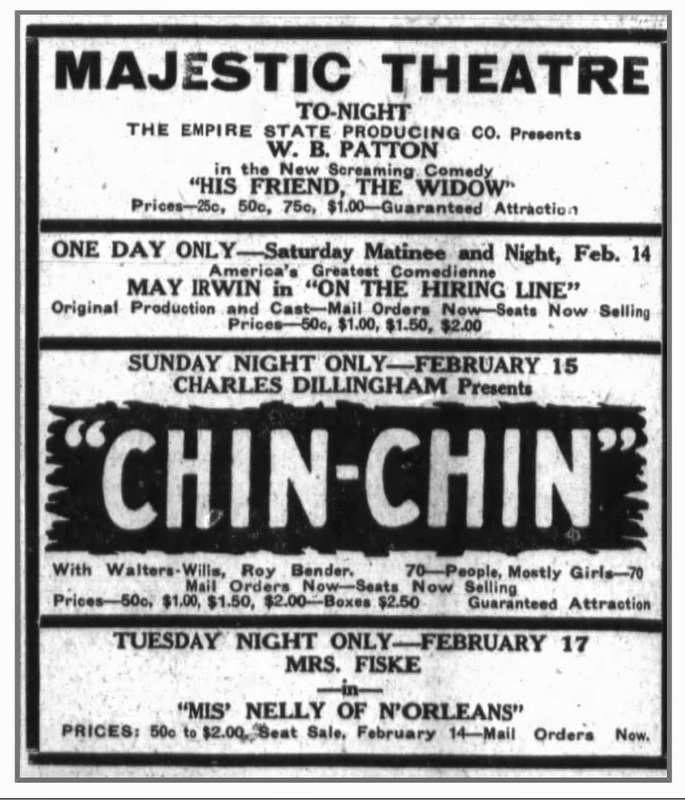 The production “Chin Chin” played at the Majestic on February 15th, 1920.
for possible news items regarding the show. Previous Previous post: Where was Mary (aka Mame) Dowd Angley Born?